By Aretha Franklin. Arranged by Tito Abeleda. Score, Set of Parts. 54 pages. Published by Visionary Quest Records (H0.532205-689329). This Pep Band Arrangement was written for Trumpet (Solo), Trumpet (3), Horn (2), Trombone (1), Tuba (1), Alto Sax (2), Tenor Sax (2), Baritone Sax (1), Percussion (3). Duration 3:22. Arrangement includes score plus parts 60 pages. Original music and lyrics were written by Otis Redding and made famous with the great Aretha Franklin for whom this arrangement tributes. Musical Arrangement by Tito Abeleda (https://www.visionaryquestrecords.com) This arrangement was specifically written for pep bands and the festive arenas where pep bands perform. This song is so flexible. You can do this with the smallest of ensembles. 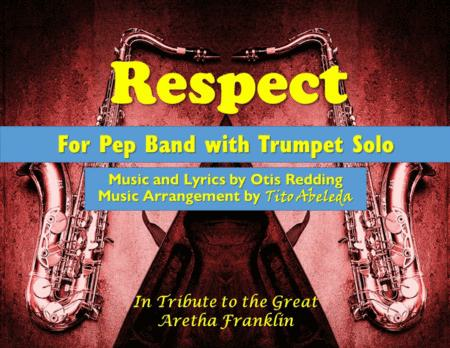 As your team's musical cheerleaders, this arrangement of Respect (originally written by Otis Redding and made famous by Aretha Franklin) was written to evoke feelings of fun, festivity, celebration, and pride in one's team. You will even find snippets to use for appropriate times in the game to cheer your team. Work with your cheerleaders to make the most of the moments in this song. The opposing team will be awe-inspired by your collective unity and team pride. A contemporary hip-hop/funk/edm flavor in the percussion serves as the canvas for this song. It will get everyone to groove. Work it! Percussionists and everyone else will have a blast with this. The percussion section that runs through the song can even stand on its to serve as motivation for the team. I also have some moments of stop time to allow for the band's choreographed gestures to cheer the team on or to interact with tean fans. As both a composer and choreographer, I can't help but visualize everything. But please feel free to let your inspiration guide you. In the beginning to get everyone jammin', I've written an introduction for percussionists to jam to some hot new rhythms and to get the crowd going. This introduction provides an exciting sense of anticipation (perhaps the team's entrance). Then the brass in championship style herald the team who have just entered. The melody of Respect is simple yet quite powerful and positive. Pick your moments from the music to use when the team needs a boost. After all you want everyone to know that you deserve the Respect, the champion pep band you are! Have fun at your games! .